Placement of signs, posters or other fixtures. On Election Day, November 4, 2014, I published two articles showing violations of LINE A Democrats. One article was about electioneering at the polling place on Sanford street on election day. The second was about the vandalism of the same lamp posts as the ones being vandalized today. The only difference is that now the city codes and ordinances are on-line for everyone to see. Please note that the LINE A sign shown above also obscures the instructions to pedestrians hidden beneath it. The ordinance specifically states: The beneficiary of such advertising shall be held fully responsible for the placement of the sign or poster and shall be treated as if they placed same. I will assume that Code Enforcer Dwight Saunders will be writing tickets to Amy Lewis, Jacqueline Johnson, Quilla Talmadge, Casim Gomez, and Mustafa Brent. Their lawn signs are intended for private lawns of taxpayers who choose to post them. The structure in front of the LINE A headquarters is NOT a private lawn, but a public place paid for by taxpayers and not intended for the use of advertising of any sort. Each person named on the above signs is in violation of the code. Notice also the LINE A sign posted on the public city trash barrel in the above photo. The LINE A vandals have pretty much taken over Central Avenue as their own private advertising space. I have many other photos that I took that can be used as evidence. I hope other taxpayers angry with this abuse by the LINE A Democrats who were responsible for the recent property tax increases AND the water rate increases will travel around the city and demand that these signs be taken down, and taken down cleanly and correctly, doing no further damage to city property that WE have paid for with our taxes. As Quilla Talmage was recently quoted in the Essex News Daily: The law is the law and, if you break it, you have to answer for it, said Talmadge on Tuesday, April 14. How are you going to say that you want to run for office and get elected to the council, if you dont abide by the laws that youre supposed to help write? It doesnt make any sense. Now we will see if she means it. Before I get scathing e-mails from LINE A Democrats complaining that they aren't the only ones to blame, make sure you send me a photo showing ANY posters from Republicans or any other party besides the LINE A Democrats who participated in this vandalism and then maybe I'll pay attention. 5/20/15 Code Violations are going into a second day. Line A doesn't get the hint. They are not taking down any of their code violating signs from public property. Above are three more violations for Quilla Tamadge. I don't know if the fine increases for every day the unlawfuly posted signs remain in place, but it at least it should be applied every day the scoff-laws continue to break the law. That's two more for Quilla Talmadge and one additional apiece for each member of the "gang of five." Except as hereinafter provided, whenever in this Code or in any other ordinance of the City, or in any rule, regulation or order promulgated pursuant to such Code or other ordinance of the City, any act is prohibited or is made or declared to be unlawful or an offense, or whenever in such Code or in such other City ordinance, rule, regulation or order the doing of any act is required or the failure to do any act is declared to be unlawful, where no specific penalty is provided therefor, the violation of any such provision of this Code or of any other ordinance of the City or of any rule, regulation or order promulgated pursuant to such Code or other City ordinance shall be punished by a fine not less than $100 and not exceeding $2,000 or by imprisonment for a period not exceeding 90 days or by a period of community service not exceeding 90 days, or any combination thereof. Each day any violation of this Code or any other ordinance or rule, regulation or order promulgated pursuant thereto shall continue shall constitute a separate offense unless otherwise provided. Any more? I can't get around like I used to. 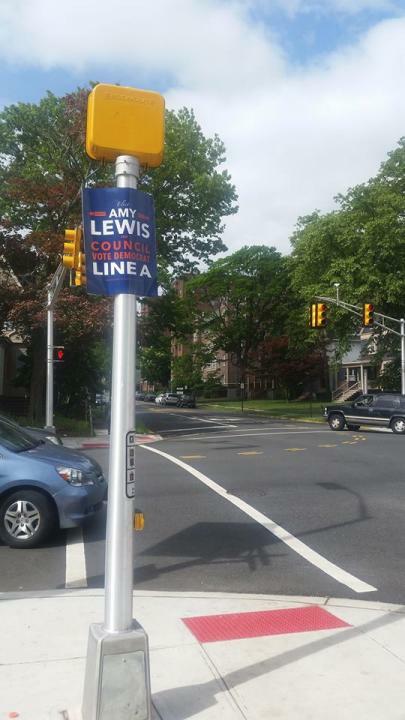 How long do we have to put up with code 238-4 violations from members of LINE A who are once again damaging the beautiful new lamp posts on Central Avenue, and posting their LINE A advertisements which NAME the violators on city property? 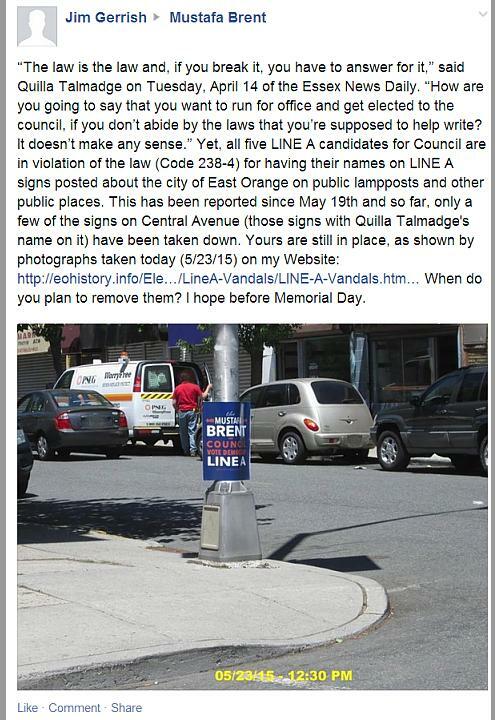 I have reported this publicly since 5/19/15, although I believe the signs were posted before that date, but the evidence has been on-line for all of East Orange to see: http://eohistory.info/Election2015/LineA-Vandals/LINE-A-Vandals.htm (reference is to this page). I request that you investigate this immediately and get the perpetrators to CAREFULLY remove all unlawfully posted signs from public property and public places without causing any further damage. Please let me know when the perpetrators will be appearing in court so I can attend and bring evidence to present on behalf of the taxpayers of East Orange. Third Day of Nose-Thumbing by LINE A Candidates. 3rd Ward Councilwoman Quilla Talmadge and 2nd Ward Councilwoman Jacqueline Johnson, both of whom have had four terms in office and who, when they took the oath of office on being elected to the council, promised to uphold the constitutions of the United States and New Jersey and to uphold the laws of the City of East Orange, laws and regulations which they make themselves and of which they should be well aware, are once again thumbing their noses at those laws and regulations which they swore to uphold. They give a bad example to newcomers Amy Lewis and Casim Gomez, but Mustafa Brent, who brags about being Vice-President of the Presidential Heights Community Association and Vice-President of the East Orange Board of Education certainly should know better. Chris Sykes, Staff Writer for the Essex News Daily, which is owned and operated by Worrell Community Newspapers, has taken upon himself the promotion of LINE A candidates at the expense of pretending to have "news" about LINE B candidates. Sykes initiated the "news" about Kevin Taylor's dog "scaring a neighbor", an event that took place in April but wasn't published on-line by Sykes until May 17th - just in time to have an effect on the June 2nd Primary Election. Then again, on May 21 (today), he published a new story about the same old dog event, and turned it into a story about Kevin Taylor's LINE A opponent, complete with information about Brent's Non-Profit work, his campaign catchphrases, and a miniature campaign speech. Instead of presenting the news as a member of the "fourth estate," Sykes has turned himself into a shill for the Democratic "machine" that runs East Orange. This kind of biased reporting by Sykes is the main reason I cancelled my subscription to the East Orange Record years ago and decided to publish the TRUE NEWS about East Orange on this Website. 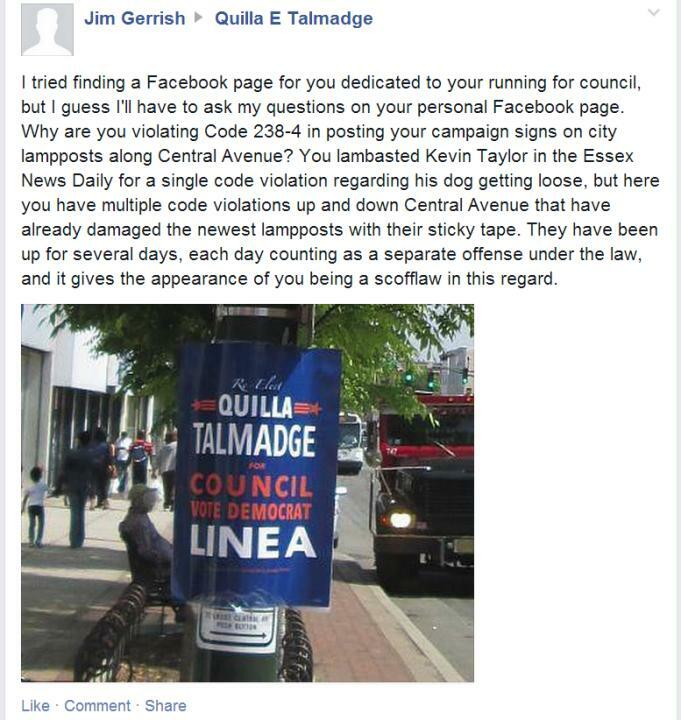 If Code Enforcer Dwight Saunders upholds the law and follows the code, Quilla Talmadge's fines should amount to well over $1,000 per day for each of the posters that continue to flutter from our taxpayer-provided expensive lampposts on Central Avenue that she has commandeered for her personal use. 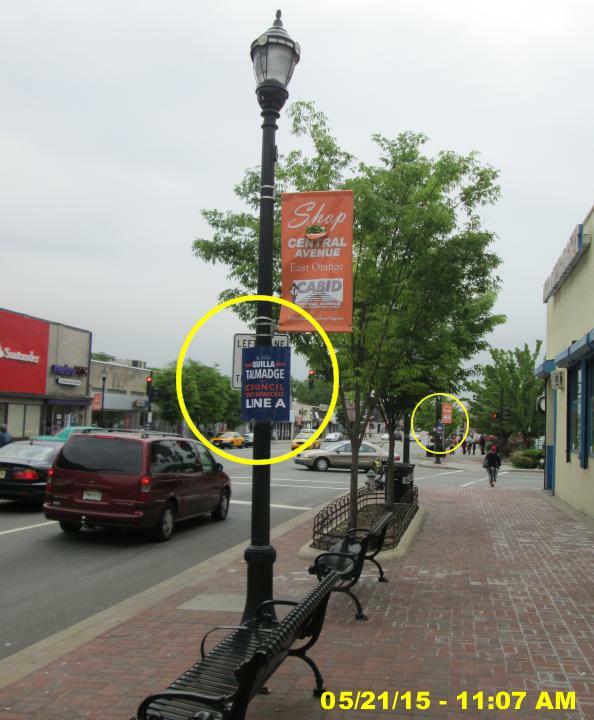 This is the third day of photo verified code 238-4 violations from members of LINE A who are once again damaging the beautiful new lamp posts on Central Avenue, and posting their LINE A advertisements which NAME the violators on city property. 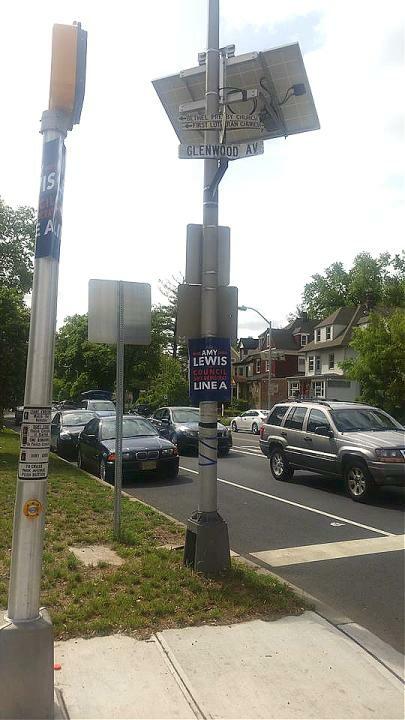 I have reported this publicly since 5/19/15, although I believe the signs were posted before that date, but the evidence is still on-line for all of East Orange to see: http://eohistory.info/Election2015/LineA-Vandals/LINE-A-Vandals.htm (reference is to this page). Although constituent services claims (on their city Web Page) "Our team takes a hands-on approach to make sure that your issue is addressed and that you receive a timely response", I still have received no response from anyone connected with the city to the above registered complaints. However, I finally put a complaint on Quilla Talmadge's facebook page and that seems to have made the difference... partially. I post it here because these things on Facebook have a way of disappearing, followed by my being blocked from ever posting there again. So if you follow down the attached links and can't find the comment, you'll understand why. The good news is that all of the signs that were stuck to public lamp posts, trash bins, "traffic controller cabinets or affixed to any signal boxes or any fixtures or appurtenances thereto" have been removed. I will have to check carefully to see that they were properly removed, since I know that no one from the city will ever check up to make sure no permanent damage was done to city property. However, LINE A, and Quilla Talmadge in particular, still seem to think that the brick enclosed tree holder in front of the store they are renting as headquarters somehow goes along with the rent. It does not. It belongs to the city, as do the two trees planted in it, and therefore is considered a "public place" under the full wording of the code. GET THOSE SIGNS OFF OUR PUBLIC PROPERTY! 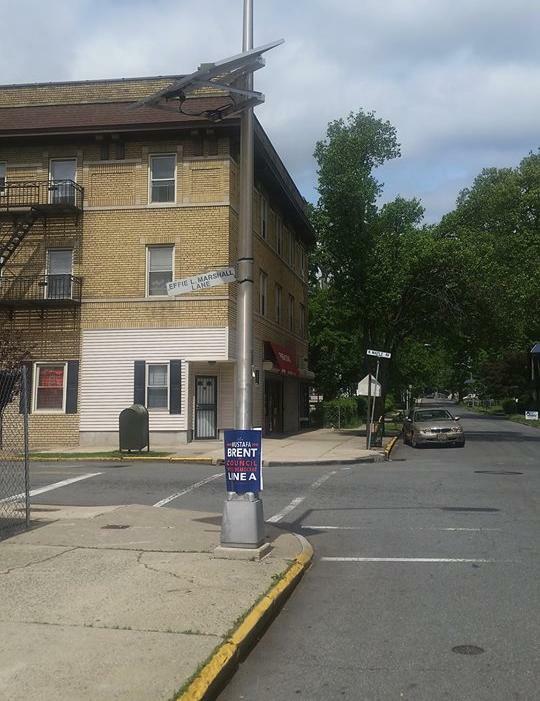 The signs are still being used in front of the LINE A headquarters at 584 Central Avenue by all five LINE A candidates to thumb their collective noses at city code 238-4 and the taxpayers of East Orange. The sign with Quilla Talmadge's name on it was hastily removed yesterday from this trash bin by "someone", but as you can see, in their haste "someone" left a portion of the sign and the packing tape that was used to fasten it to the trash can. I'd say that is a big clue as to what I am going to find when I carefully examine each of the other locations where her signs were unlawfully affixed to public property. 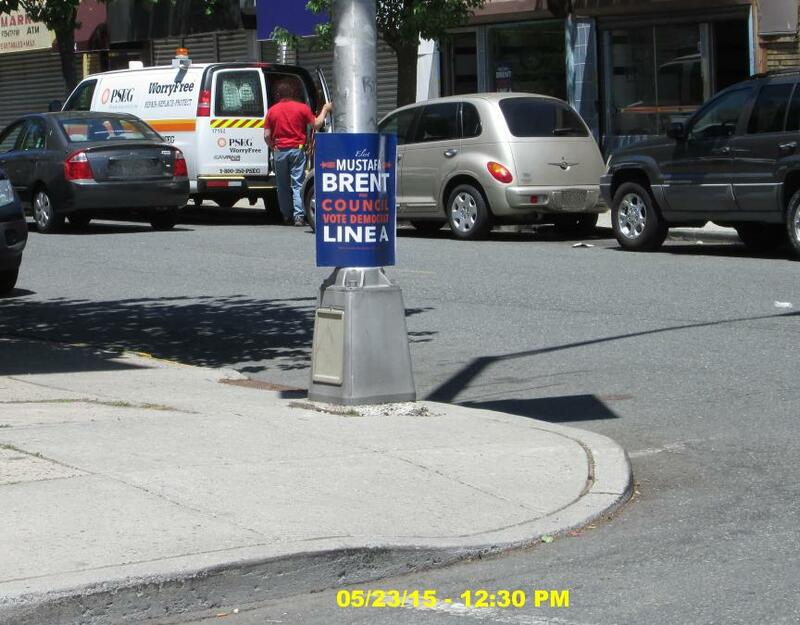 Meanwhile, thanks to a friend who was able to drive me around East Orange, I discovered that our School Board Vice President and Fifth Ward LINE A Council Candidate Mustafa Brent had not bothered to remove his signs at all. If you visit his Facebook Page or his Website, it doesn't appear that he is not only a city code violator, but a scofflaw as well. Looks are deceiving. Additional signs were posted on each corner at North Oraton Parkway, both northbound and southbound. Additional signs with Mustafa Brent's name on them were posted on 4th Avenue between 17th Street and 19th Street. 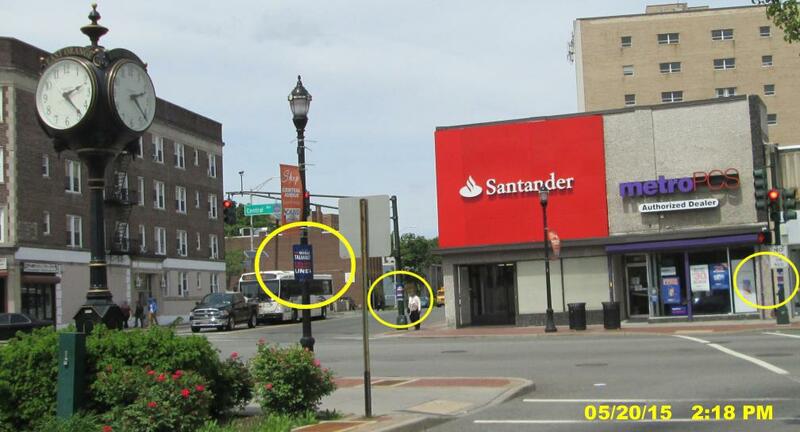 Additional signs were posted on each of the four corners at N. Arlington and Springdale Avenues. Since you have chosen not to respond to me about any actions being taken to remove all LINE A signs that are unlawfully posted on public lampposts and public places around the city of East Orange, I will simply report that it has been four days of code breaking (238-4) by all five LINE A candidates for council. Once again, I request that you investigate this immediately and get the perpetrators to CAREFULLY remove all unlawfully posted signs from public property and public places without causing any further damage. Please let me know when the perpetrators will be appearing in court so I can attend and bring evidence to present on behalf of the taxpayers of East Orange. 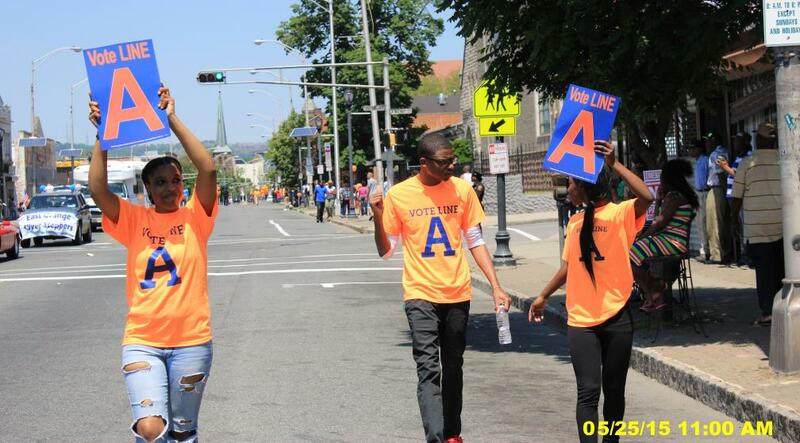 In spite of a ban on ALL political activity during the Memorial Day Parade, here are three Line A marchers violating that ban and promoting LINE A, actually walking IN the parade beside the Silver Steppers. 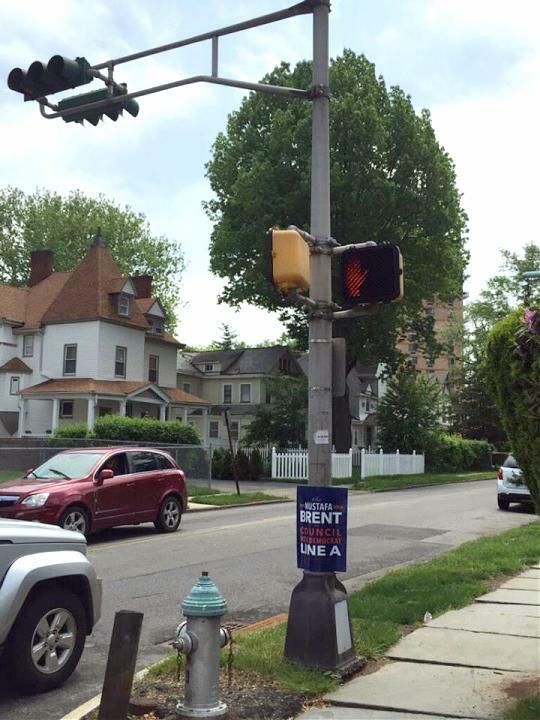 The photo was taken at the intersection of MLK Blvd and North Walnut. If anyone else took photos of either LINE A or LINE B violators, send them to me so I can post them on this page of shame. You would think that at least ONE of the Council candidates would have respect for Memorial Day, but EVERY member of the "gang of five" Line A candidates still have their signs posted on public property on Central Avenue. And now we can see a consequence of breaking laws. Since current and future members of the City Council have no regard for the law, others have begun to take notice and now some graffiti has been added to the top of the wall. Judge, please note that the posters have signs on each side, so each sign should count for two separate code violations, and the penalty should be doubled for each one. They have been posted now for eleven days since we first began photographing the violations, and each day counts as a new violation, according to Code Chapter 1 -15 (General Penalty) section C : "Each day any violation of this Code or any other ordinance or rule, regulation or order promulgated pursuant thereto shall continue shall constitute a separate offense unless otherwise provided." The signs are finally gone. I'll have to go back and see if anyone erased the grafitti, but at least the stately old historic building that provides space for businesses on Central Avenue has a chance of attracting some high class respectable business when LINE A finally moves out after the election. I will be holding all my dated photographs for use as evidence, if the city can't collect the appropriate fines from those responsible and the case has to go to court. If we want East Orange restored to its former beauty and respectability, we can't let a few Council members and wannabee politicians drag OUR city down. 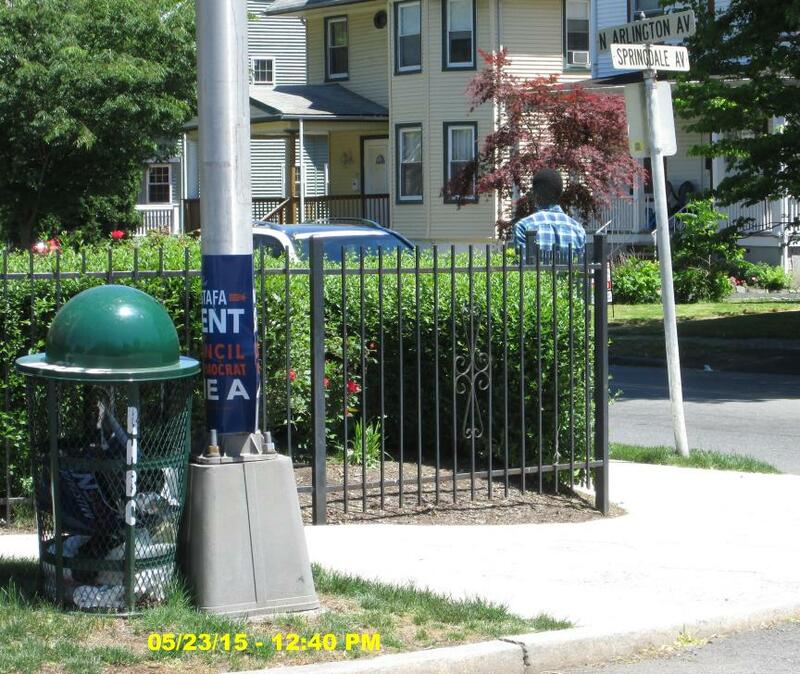 5/31/15 More Violations - This Time In Moving Vehicles! Forward to 10/31/15 - Line A Democrats Are Doing It Again!